Today, I made some paper bags for a customer. 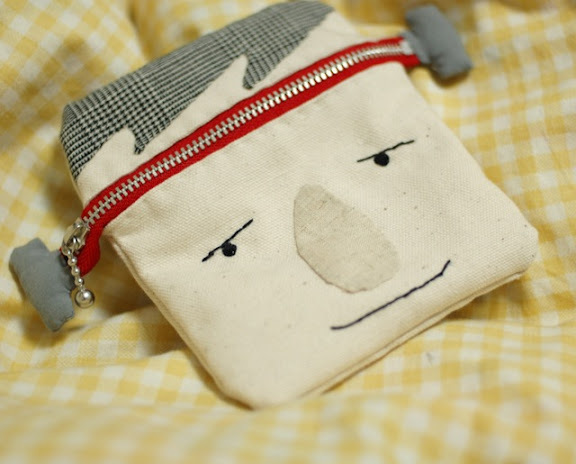 So I'd like to write how to make a paper bag. I used some pages of magazines. 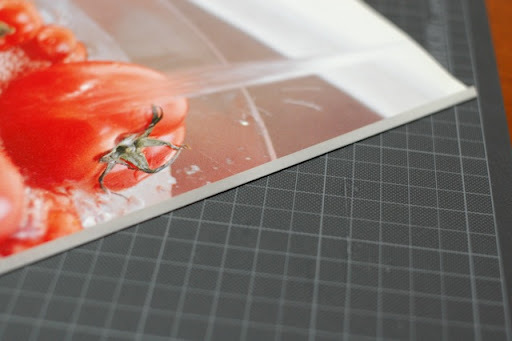 (1)Cut two pages from a magazine. 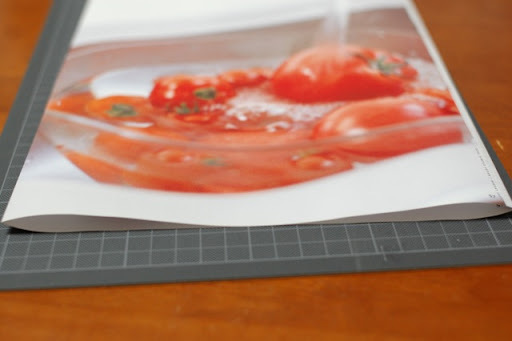 (2)Paste the edges of two pages together. 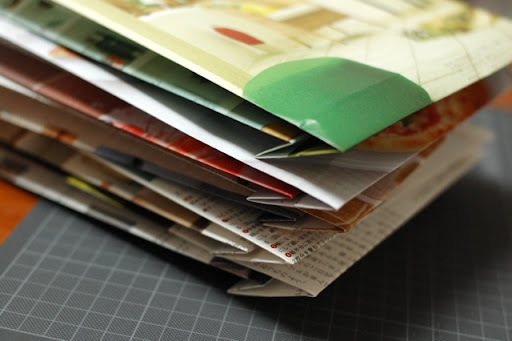 (3)Fold each side of the bag in same width. In this case, I folded in 1 inch. (5)Fold the bottom of the bag. In this case, I folded in about 2 inches. 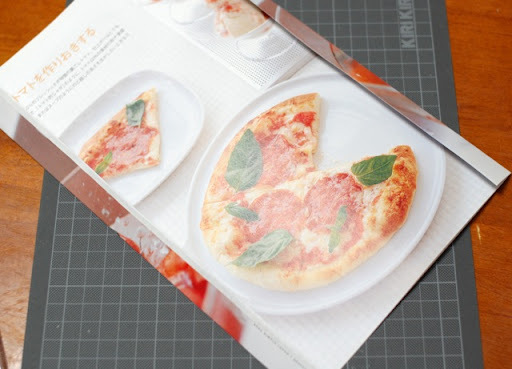 (7)And fold it like the pictures. (8)You did it! I love this one very much because I love tomatoes!!!! I made five bags today. Thank you for reading my poor English instruction. 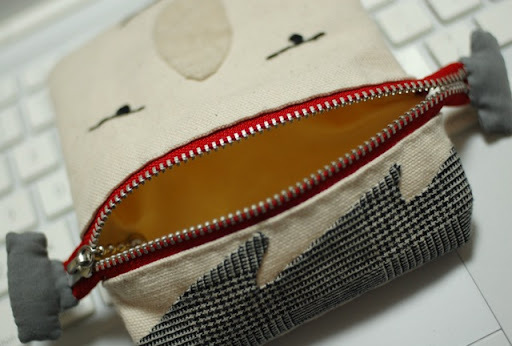 My boyfriend gave me this new idea of zipper pouch. Also, I made Japanese lunch box. They are coasters. Onigiri(rice balls), grilled salmon and fried egg. 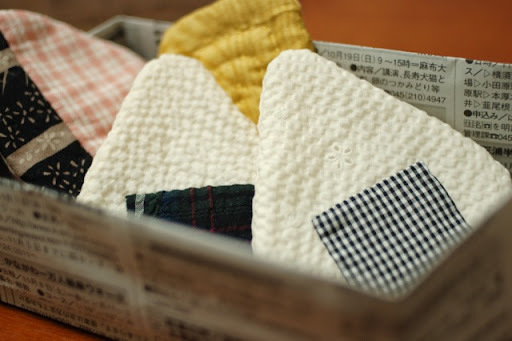 It's very easy to make this kind of boxes with paper. 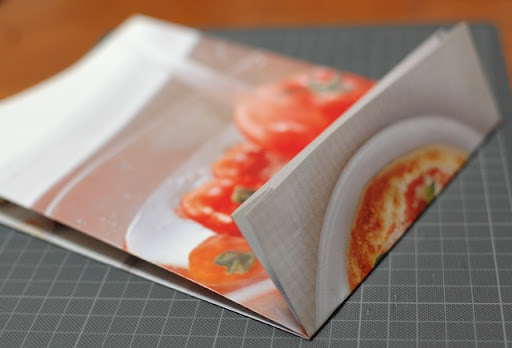 Next time, I'll try to explain how to make a box from a piece of paper. I thought this design while I was studying. 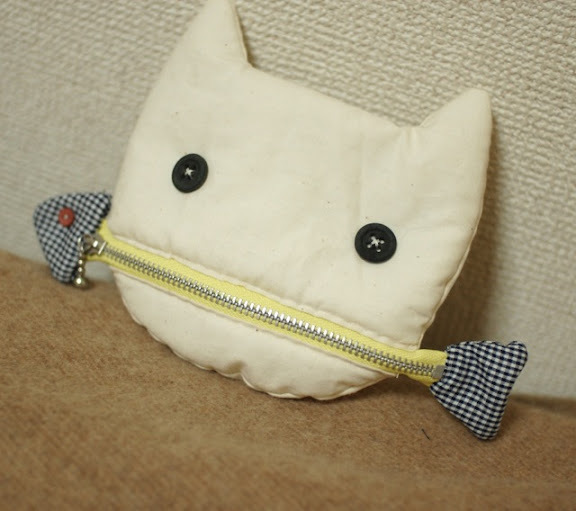 Suddenly I came up with the idea, and soon I went to the nearest sewing shop to get some zippers. But I had to take 2 exam this weekend, I had little time to sew it. So, I could make only one last week. I listed it up soon, and happily a customer got it soon. Thank you!!!! After the exam, I made two new ones. It's fun to think new ideas! The exam is for certification of bookkeeping. I like reading books and studying something, and I didn't know much about money. So I studied bookkeeping at first. 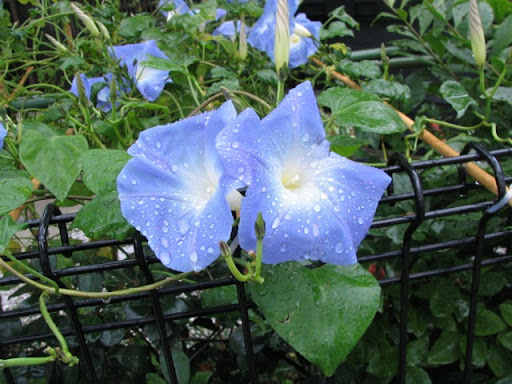 I like walking in the rain, without umbrella. When I went out yesterday, it sprincled a little, but I didn't bring my umbrella. 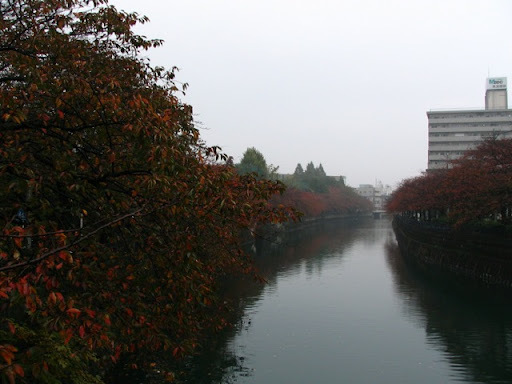 I walked along the river. 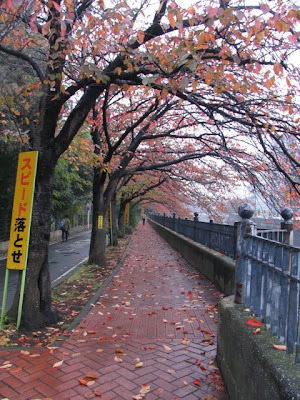 There were a lot of cherry trees. They saved me from the rain. Sometimes, they dropped a big rain drop on me. I feel as if I'm playing with the rain and trees. 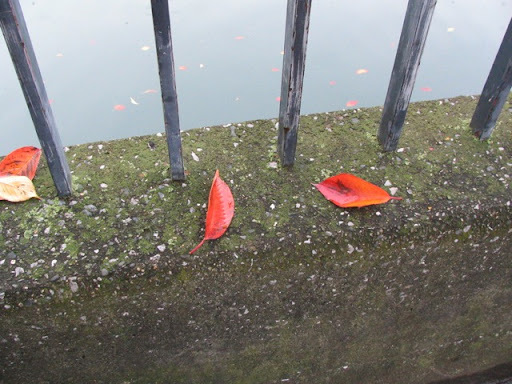 Now, it's the season of fallen leaves in Japan. 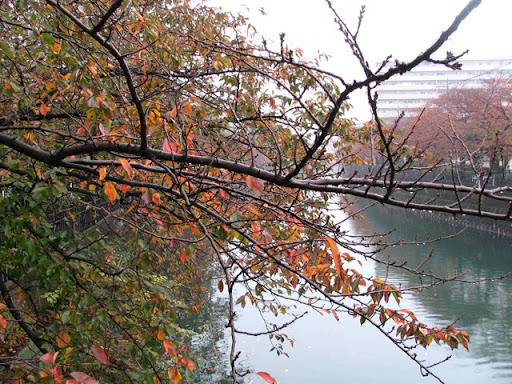 The leaves of cherry trees turned red and it's very beautiful on the river. Contrary to spring, there are few people under the trees. So I walked under trees singing my favorite songs. 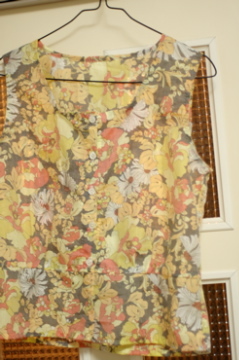 I sewed a new shirt for myself. I bought the cotton with only 2 dollars. 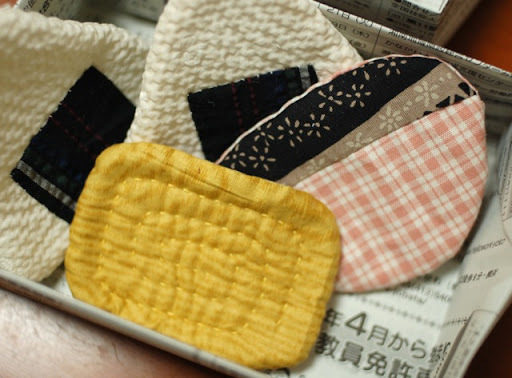 It is very thin, so I cannot wear it on till next spring.. I took this pattern from a book, titled "sewing talk". It fits me very well, so I ordered some fabrics at an online shop to make other shirts. 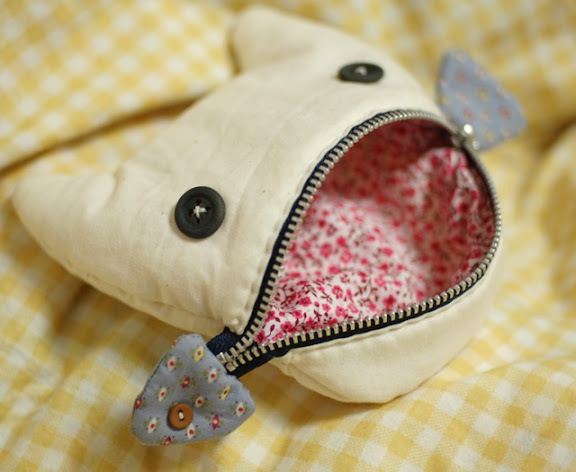 As always, I sewed it all by my hands, but it took only 3 hours or so. 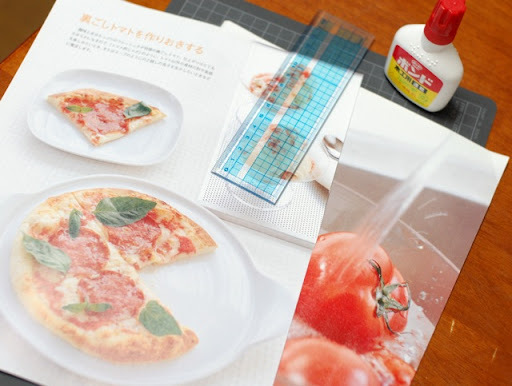 When I was in California, I met an Italian girl who liked Japanese manga very much. She likes Japanese girl's sailor suits especially and asked me to show her my old ones(But I've already thrown them out...). 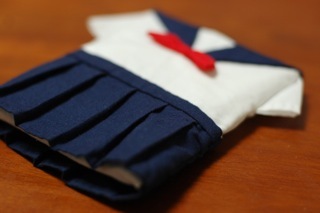 I remembered it today, and I made a sailor suit shape pouch. This suit is summer version. 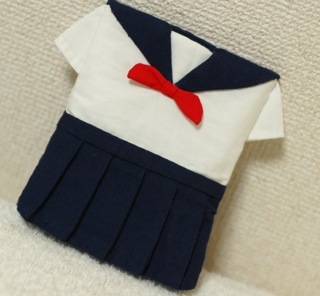 It closes with a snap on the back of sailor collar. 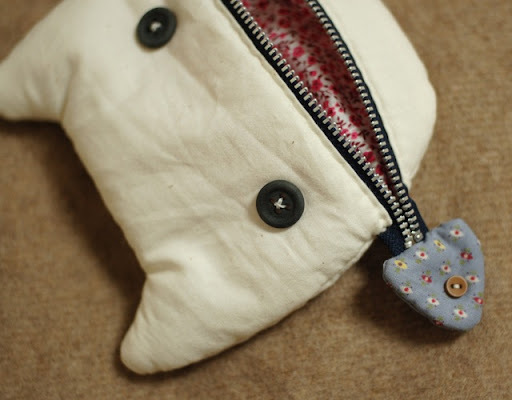 It was difficult to put the pleated skirt on the pouch and I couldn't make it in a good way... I'll try again! These are what I bought today in a big super market near my house. 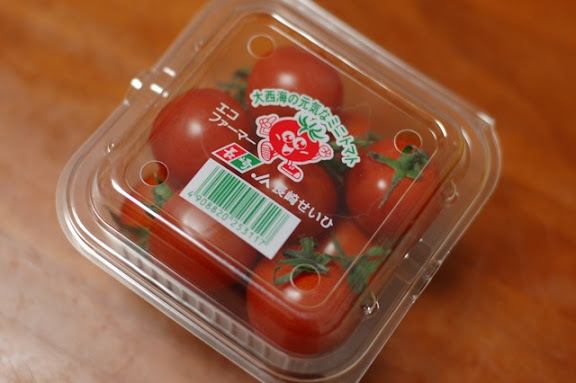 I want to show you how foods are packed in Japan, and how much they are. These days, the prices have risen. 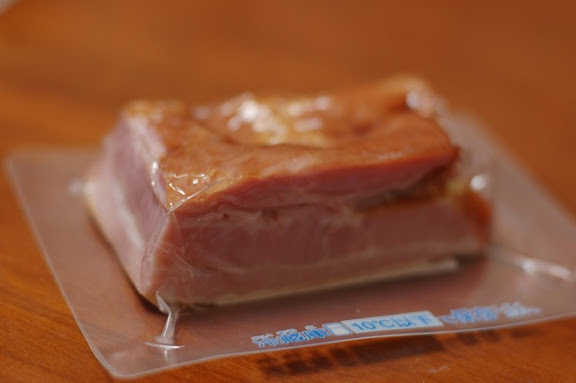 This is a packed bacon. It costs 1.5 dollars per 100g. 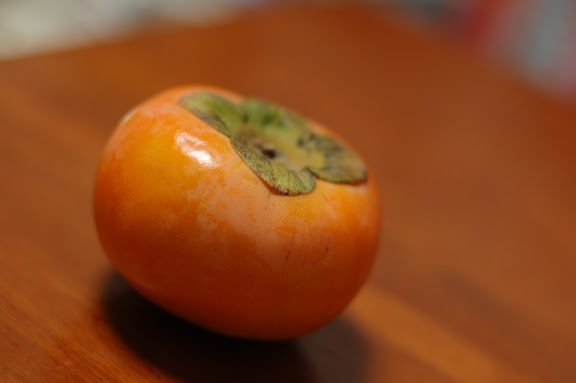 This is a Japanese persimmon. One persimmon costs 1 dollar. 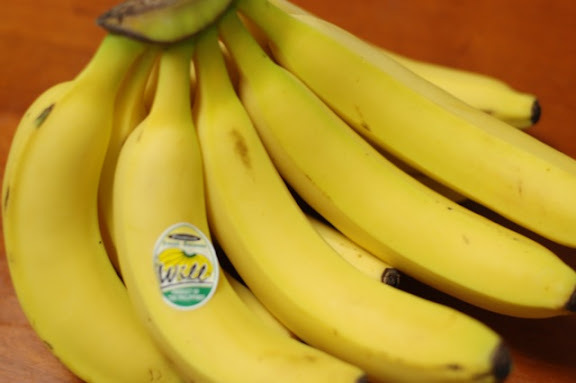 This is a part of branch of bananas, from Philippines. It costs 1.5 dollars. 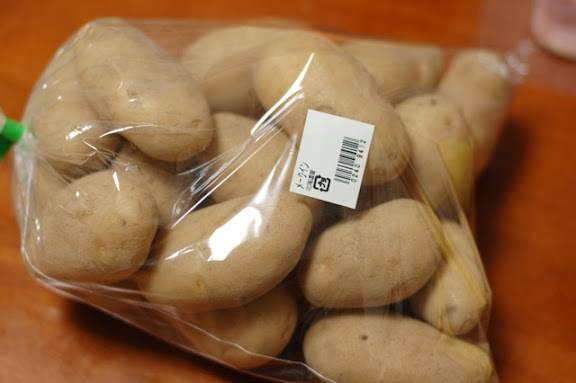 This is a pack of potatoes. It costs 1 dollar. 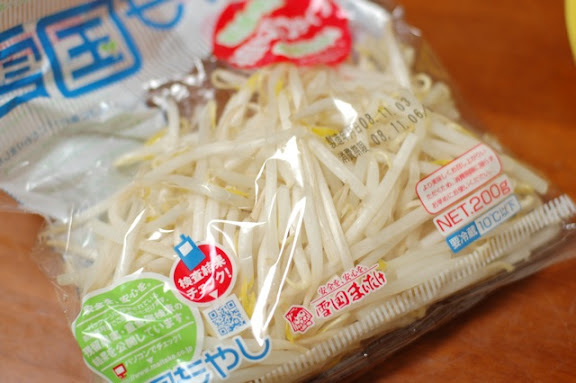 This is a pack of bean sprout. It costs 50 cents. 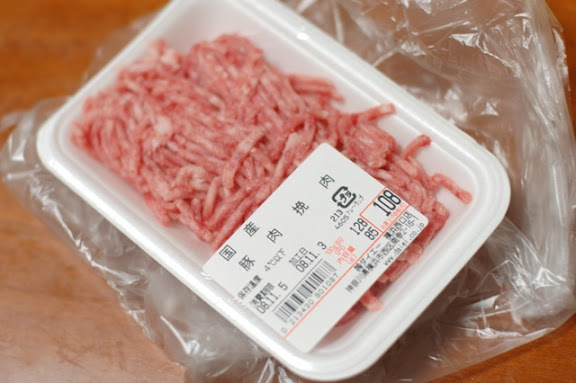 This is a small pack of ground pork. It costs 1.3 dollars per 100g. This is a pack of California raisins. In a pack, there are 240g raisins and it costs 3 dollars. That's all. 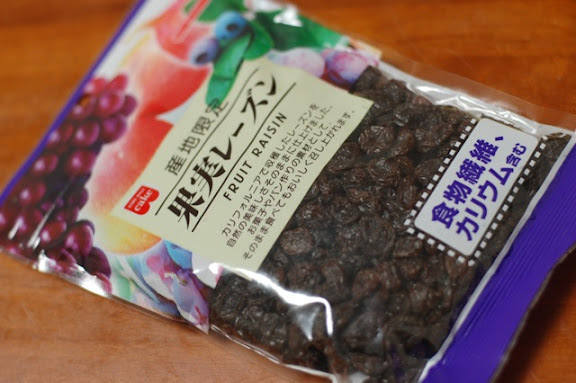 Bananas and raisins are imported and others are Japanese. There are lots of imported foods, but I buy Japanese as much as possible. How about are the price and package compare to your supermarket?